Both Wicked Plants and Wicked Bugs have captured the imaginations of botanical gardens, science museums, zoos, libraries, and other institutions around the country. Several exhibits have already begun based on the "Wicked" concept, and more are in the works. 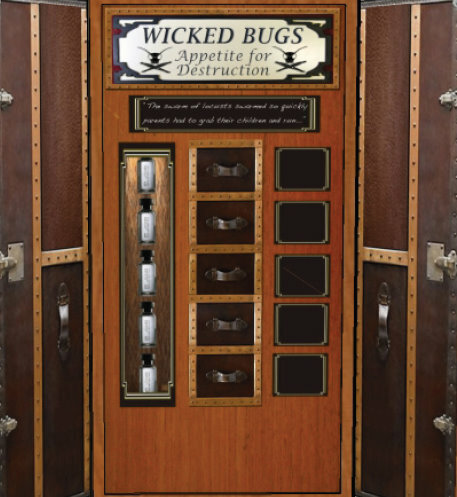 National traveling exhibits based on Wicked Plants and Wicked Bugs are accepting bookings now. Read on for more information. Are you interested in creating, hosting, or sponsoring an exhibit based on Wicked Plants or Wicked Bugs? Contact Amy Stewart to find out how. Created by the North Carolina Arboretum, this national traveling exhibit based on Wicked Plants launched in spring 2012. Visitors discover the evildoers of the plant world lurking in their own backyards and beyond in a 3,000-square-foot interactive science exhibition. 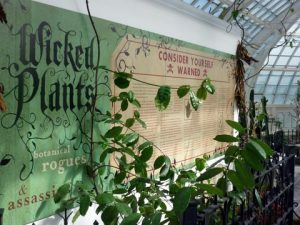 Wicked Plants: The Exhibit is designed to educate the general public about plants that are harmful to the human body and to increase science literacy regarding the use of harmful plants and plant derivatives. The exhibit will expose plants associated with a myriad of negative health effects, including addiction, obesity, allergies, pain, poisoning, cognitive impairment, organ failure, brain disorders and even death. Summer-Fall 2012 The North Carolina Arboretum, Asheville N.C.
Spring-Summer 2013 Biltmore Town Square, Asheville N.C.
Fall 2013 Catawba Science Center, Hickory N.C.
Spring 2014 Heritage Museum & Gardens, Sandwich M.A. Summer 2014 Heritage Museum & Gardens, Sandwich M.A. Fall 2014 Springs Preserve Museum, Las Vegas N.V.
Spring 2015 Virginia Science Center, Richmond V.A. Summer 2015 Pink Palace Museum, Memphis T.N. Fall 2015 Stark Museum of Art, Orange T.X. Spring 2016 Western Heritage Museum, Hobbs N.M.
Summer-Fall 2016 Florida Museum of Natural History, Gainesville F.L. Summer-Fall 2017 The North Carolina Arboretum, Asheville N.C.
Go here for tour schedule updates and more information. 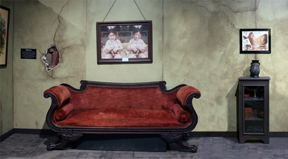 Created by Outhouse Exhibit Services, this shadowbox art exhibit is perfect for institutions with gallery or wall space. Fifteen of the copperplate etchings created by artist Briony Morrow-Cribbs to illustrate Wicked Bugs are presented in a shadowbox, along with specimens and interpretative text. It's affordable and easy to ship. The art may be exhibit with the portable exhibit, on its own, or with other materials from an institution's own collection. Download the exhibit prospectus here (PDF) or visit the exhibit website here to get details and contact information. Now booking for 2014 and beyond. Created by Outhouse Exhibit Services, this portable exhibit is steamer-trunk inspired and ready to travel. A free-standing exhibit requiring only an 8 x 8 foot space, this exhibit is designed to be supplemented with an institution's own collection. It's affordable and easy to ship. 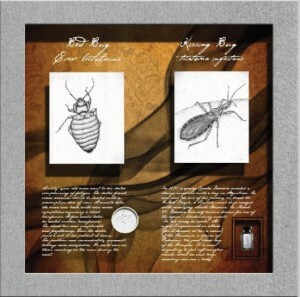 In addition, a shadowbox art exhibit, complete with specimens and copperplate etchings from the book, may be exhibited on its own or with the portable exhibit (see below.) Visit the website for the exhibit here. Download the exhibit prospectus here (PDF) to get details and contact information. The Tucson Botanical Gardens' Wicked Plants exhibit included a guided plant walk through plants already in the collection, supplemented with container plantings marked with colorful signage. 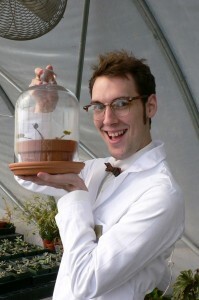 A mad scientist, Dr. Ergot Ratbane, played by a member of staff, inhabited a creepy laboratory filled with specimens, microscopes and magnifying glasses, images, video, a "wicked plants" journal, coloring books, and other educational material. 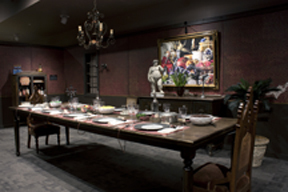 The meeting room and lecture hall featured an exhibit of creepy art assembled by the staff. Programs included a plant walk and lecture with Amy Stewart and regular plant walks with staff. 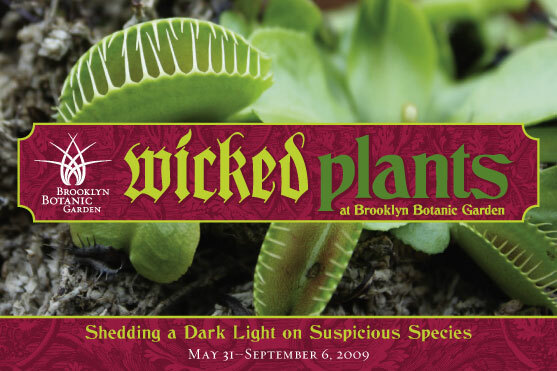 In 2009, the Brooklyn Botanic Garden created a Wicked Plants exhibit that included a wicked garden around their lily pond terrace; a plant walk with an interactive map and cell phone-based audio tour; an exhibit of Briony Morrow-Cribbs hand-tinted copperplate etchings from the book; a lecture series; a set of "wicked plants" trading cards for kids, and an interpretative cart with games for children. It’s mayhem under glass, as the Conservatory of Flowers transforms its Special Exhibits Gallery into an eerie Victorian garden full of Mother Nature’s most appalling creations. As visitors enter the exhibition, they find themselves in a mysterious, untended yard behind a ramshackle old Victorian home. Peeking through the window, it’s clear that a crime has just taken place. A man is slumped over on a table, a goblet in his lifeless hand, as the lady of the house flees in the background. Crows caw, and a rusty gate creaks. In the overgrown garden, moss covered statues rise up out of an unruly thicket of alluring plants. The exhibition features over 30 species of wicked plants from those with famously scandalous histories to those that grow “innocently” in millions of gardens and homes today. Visitors can enjoy corresponding excerpts from Stewart’s book full of bloodcurdling tales and fascinating facts on signs throughout the gallery. This entirely indoor exhibit includes a dedicated wing of the Conservatory filled with "wicked plants," signage that includes text and illustrations from Wicked Plants, a special soundtrack of eerie sounds, a collection of specimen jars with seeds and dried plants, and a gift shop offering Wicked Plants-themed merchandise. A season-long series of programs and lectures include a visit from garden mystery writer Rosemary Harris, an after-hours beer tasting, three special events with Amy Stewart, and more.